The Indefatigable, a ship, docks in London in 1814. One of the passengers is Maggie Broad, moving back to England after managing a successful farm in New South Wales despite her husband being a known alcoholic. Her knowledge of plants earnt her a reputation as a witch. She’s come to seek revenge on behalf of her daughter, Maria. Constable Charles Horton has been despatched by magistrate Aaron Graham to investigate strange occurrences at Thorpe Lee House, owned by Sir Henry Tempest. Graham knows about these disturbances because his estranged wife is living there as Tempest’s mistress. The house’s occupants are willing to write off the strange occurrences – including broken mirrors and the death of two dogs – as being the results of witchcraft. Horton’s own wife, Abigail, has sought temporary respite in an asylum, Brooke House. After Horton’s last case where she ingested part of a hallucinogenic plant, she is still suffering strange visions. At Brooke House, she finds a far from therapeutic environment and ends up helping with the patient in the room next to her. Maria has been confined to a straightjacket, suffers terrible visions and is clearly extremely distressed. Against this strange background, Graham discovers a series of locked-room murders of aristocrats who all belonged to a secret society dedicated to pleasure. At their most recent party, a trio of prostitutes were procured. One of them, for whom it became apparent that the party was her first night as a prostitute, is called Maria. Both procurer and one of the two remaining prostitutes are found dead, apparently by their own hands. Graham and Horton discover that Tempest is also a member of this secret society/ Horton uncovers evidence that Tempest was at the party. He also discovers that the drinking water had been tampered with. Through a contact at Kew Gardens (used in his previous case), Horton learns the leaves found in the drinking water are from a plant that grows in New South Wales. Can Horton and Graham uncover the link between this plant and the attendees at the party before any more deaths occur? Having befriended and tried to help Maria, has Abigail put herself in danger? Lloyd Shepherd weaves history and the elements of a thriller together expertly and deftly. Despite the historical restrictions, the plot is pacey. The magic and witchcraft elements are handled credibly. The underlying logical explanation is not withheld and unwrapped as a final denouement, but revealed clue by clue as Horton investigates. The investigation is interwoven with notes from Dr Bryson, in charge at Brooke House, where Abigail and Maria find themselves. The notes offer insight into treatment methods for those consider to be insane at the time. 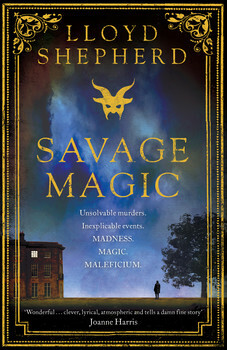 “Savage Magic” is a satisfying tale that will appeal to lovers of historical fiction, readers looking for a thriller that isn’t a police procedural or full of forensic jargon, and readers looking for a good story fluently told.